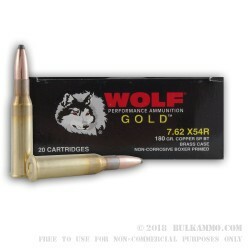 The WOLF GOLD line is a direct market competitor to the other producers of premium ammunition to the American market. Instead of utilizing the proven lines of the WOLF import model, it eschews the cheap steel casings and Berdan primers and full metal jacket projectiles in favor of Brass cases, high quality components and Boxer Priming, to give the American shooter a reloadable case. Good quality rounds suitable for use in hunting and other aspects of the sport shooting market here in the States. 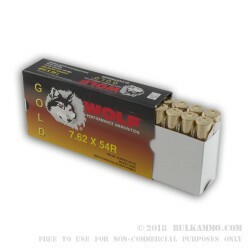 Other producers ought to be worried, because if WOLF Ammo, with its massive footprint can manage to get the Gold line to take off, it will ravage the market share with the offering. It boasts a sportier package and generally a soft point or hollow point design across the entire line, with this offering being a 180 grain soft point projectile, suitable of taking some of the largest game in North America. This ammunition is suitable for use in any modern firearm that can accept the 7.62x54R and offers a velocity of 2641 out of the barrel. The quality is above average and the caliber/cartridge mix is compelling for the GOLD line.